Potatoes are my friend – boiled, mashed, roasted, hash browned, I love them every way, and in the summer, potato salad is my favorite. 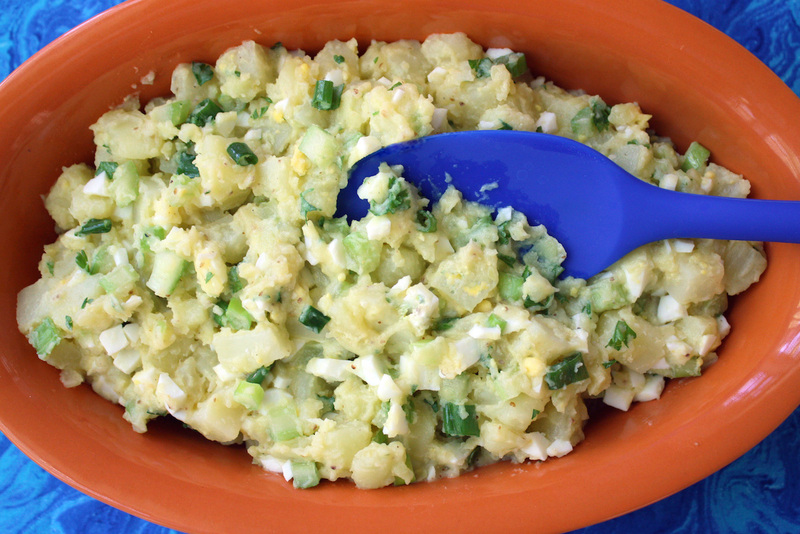 I tried for years to make a good potato salad without mayo but was never happy with the result. It was always too dry and if I added more oil, it was too oily. This time I decided to try something different. I added some of the potato cooking water to my dressing and it was better but still not good enough. Then I tried something crazy. I mashed a little bit of potato and added that to the dressing along with the water. Bingo! It was great. The potato salad was creamy, tangy, and delicious. One Comment on "Potato Salad Without Mayo"
Just made this, thanks so much for the suggesting weight of potatoes to buy, loved this, get sick of mayo all the time, I grew fresh dill, put it before the potatoes cooled to maximize flavor worked well,🌹 another rose for you!